July 8, 2010. That was the day I discovered that I could play Weiqi better than a ten year old in China. In 2010 I spent three weeks taking classes at the Wenbo School for children (The Wenbo Weiqi Training Center Wenbo weiqi peixun zhongxin) and its summer school in a different location. In the first week, most of the children were on vacation and the school only offered one beginning and one lower-intermediate class. Much to my surprise, and even more of a shock to my teachers, I turned out to be the strongest player in either class. Mrs. Wang, the accountant, head administrator, and joint owner of the school with her husband, quickly learned of this. Determined to find a worthy opponent for me she began bringing in stronger players, who normally came to the school for private lessons, to test my mettle. When I defeated the first three of these opponents, Mrs. Wang displayed her boundless enthusiasm and began searching in earnest to find me a worthy adversary. Playing Weiqi in China I suffered the disadvantages of having had no formal training and growing up in a culture that does not commonly play Weiqi-I didn't purchase my first book to study the game until I was thirty-eight years old. To be fair, it should be noted that I had several advantages in these games as well. The most obvious of these was that my classmates were, on average, ten years old. Second, as often happens when I play Weiqi in China, my opponents often started our games in an overly aggressive fashion because they assumed that an American would not recognize the traps of a beginner. Perhaps most importantly, as word spread of my victories, a growing number of students, teachers, and staff came to watch. This was a tremendous load to bear for a ten year old who was attempting to uphold his country's honor. It was very little pressure for a forty-five year old American who was so far past his Weiqi prime that the only thing he could do was surpass startlingly low expectations. After my second day of classes, Mrs. Wang marched in a new opponent to challenge me. He was a stern and focused nine-year old with a 3-duan amateur rating and therefore already a better player than most people would become in their lifetimes. At this point the room was packed full with spectators, including the teachers, several students, and even the female staff who usually showed no interest in the game. My opponent, who had earned a reputation for being something of a Weiqi prodigy, was small in stature but radiated natural intelligence and had honed killer instincts for the game. His intense stare seemed to penetrate the board-an entirely different feel from the other somewhat fidgety students I had played against up to that point. He quickly took the lead. After I conceded my loss half way through the game he stood up, turned around without a word, and, heedless of his mother's admonition to say goodbye, walked out of the room without a backwards glance. I felt as if I had met Bobby Fischer's reincarnated spirit in the Weiqi world and I tried to suppress a smile. Weiqi is a board game that originated in China and was already well known in the time of Confucius (551 BC - 479 BC). Referred to as Go in the US, Igo in Japan, and Baduk in Korea, the word "Weiqi" is made up of two Chinese characters; wei (to surround) and qi (logic game).4 The appellation "surrounding logic game" vividly evokes Weiqi's primary goal, which is to try to take one's opponent's pieces by surrounding them while simultaneously accumulating additional points through encircling empty space on the board. Today, the PRC, Japan, South Korea, and Taiwan are the epicenters of the Weiqi universe though, with the advent of the internet, it has a steadily growing fan base in the West as well. I refer to Weiqi as a Chinese game but in much the same way that the Chinese origins of gunpowder and paper have become largely irrelevant in today's globalized political economy Weiqi now belongs to several nations. Japan's almost four centuries of Weiqi supremacy, South Korea's dominance in this sphere from the mid 1980s to approximately 2008 when China became a serious contender, and Taiwan's strong presence in international competitions have so advanced the theory and practice of the game that it has been transformed into something very new. Weiqi's popularity in China is often part of a choice to embrace a lifestyle that evokes nostalgia for gentry scholars in imperial times. Its long history has resulted in contemporary dreamscapes that draw on images of noblemen and intellectuals, generals and emperors who played the game. This imagery makes a particularly strong statement in the PRC where elite culture was dismantled in favor of a new communist utopian movement. Weiqi is an iconic reminder of perceived regional differences. In Taiwan one never sees Weiqi played in parks-the game is too embedded in elite culture. In the PRC, the city of Chengdu is quite famous for the prevalence of Weiqi players in parks and teahouses. In Beijing, where I conducted my research, it is less common to see people playing Weiqi at parks, although those who do so display a remarkable devotion to the game. Chinese people's love of board games is in part born of a culture that places no stigma on intelligence. There are few of the cultural stereotypes of nerdiness that one might associate with these activities in the US. Board games admittedly lack the cool factor of rock music or club culture, but in China one rarely sees depictions, so pervasive in the West, of mad genius game players rushing to their doom.8 Chinese people's appreciation of board games extends to games in general. Outings that include alcohol will inevitably feature drinking games in one form or another. It is a social activity that relieves the strain of witty banter and becomes a way for the entire group to participate. This might include competitive drinking (a game in and of itself) or those on the sidelines cheering them on. Though more sedate, Weiqi in parks evinces a similar sociality. A handful of people play and groups of twenty to thirty bystanders spend the day watching, kibitzing, and perhaps rotating in to play themselves if the mood strikes them. Weiqi is central to China's dreams of self and other, past and present. Given that China houses the largest population in the world it is surprising that there has yet to be an anthropological study of this topic. Television programs, several journals, and an array of instructional books are devoted to instructing players in Weiqi. These texts include issues such as general strategies as well as "life and death" problems. The increasingly transnational character of the game includes internet servers that allow online competition between players from countries as diverse as Brazil, China, and Estonia. Online reviews of games, as well as sties devoted to teaching Weiqi, have created a contemporary environment that can arguably be considered to be Weiqi's golden age. Though embedded in traditionalist discourses that draw on images of Imperial China's cultured gentlemen, Weiqi has also become part of a far more modern world. With the advent of international competitions, as well as Japanese manga and anime revolving around the game, Weiqi has transformed into an intensely modern transnational experience. This ability to simultaneously represent both the ancient and the futuristic is a vibrant example of how, far from being antagonistic forces, traditionalism and modernity revolve around each other in symbiosis. In Beijing, most people who play Weiqi online use the internet server "Tom." Because one must negotiate a densely packed Chinese-language web site to find the Tom server, and because one needs a Chinese ID number to register, it is an overwhelmingly Chinese domain. Many people I interviewed in Beijing also use Korean servers or IGS (Internet Go Server, a.k.a. Pandanet).9 KGS (the Kiseido Go Server) is by far the most popular Weiqi server in the West.10 The vast majority of Weiqi players on KGS use English as a lingua franca, though one also sees an array of other languages being used as well. As an anthropologist I find KGS to be the most interesting server because of the online community that it has fostered. As with other Weiqi servers, KGS has unicode capability that allows users to communicate in any language by typing comments in a dialogue box to the right of the game. These servers also include the ability to save and edit games. This means that people can review games together or they can entreat, or employ, a stronger player to review their games and point out areas for improvement. When beginning a game on KGS, it is typical for opponents to exchange casual greetings. This usually takes place in English, with a set of stock phrases such as "hello", "enjoy", or "have fun." The games frequently end with "thanks", "bye", or "good game." Some people enjoy having conversations while they play, whereas others prefer to focus on the game without distractions. When they have finished, many players review their games with their opponents. One can also watch other people's games and strong players frequently attract fifty to one hundred spectators. On occasion, two to three-hundred people will gather to watch if a game takes place when people are not working and the players are ranked highly enough to draw attention. Spectators often comment in the dialogue box while a game is taking place, though the people playing the game cannot see the comments until they have finished. At its best, the stronger players watching the game point out particularly good and bad moves. Often, the spectators will use the dialogue box to engage in casual banter. Figure 1 is a KGS game with 118 spectators. As sometimes happens, those commenting on the game seem to have forgotten about the game altogether, preferring instead to focus on a conversation that they are having about unrelated matters. In this particular case the spectators primarily use English but they also interject French and Spanish as well. In other instances, there might be several distinct conversations going on at once. In a dialogue box that primarily consists of English, for example, one might also see several people writing Russian while a third group of spectators communicates in Chinese. As in any online setting, one is occasionally confronted with antisocial behavior, including rude comments. For many, the most frustrating behavior is something called "escaping." This refers to when someone leaves a game before it is finished, which usually occurs when the escaper is losing a game. On IGS, someone who does this automatically forfeits his game. Many people complain, however, that this unduly punishes people with bad internet connections who try to return after being disconnected only to find an abandoned game. On KGS nothing will happen if someone leaves one game. If he escapes ten games in a certain period of time, however, his unfinished games will all automatically be forfeited. Unfortunately, there are players who use this system to inflate their ratings and play stronger opponents. Their ratings will plummet when they are penalized for previous escapes, at which point they can simply start a new account. The only real deterrent is that many people will not play someone without a rating and it takes some time and effort to regain one's rank. Escapers are a constant frustration for most. Yet, given that there are no real repercussions for bad behavior, combined with the ability to hide one's true identity, the relative lack of impolite behavior is in many ways more remarkable than its presence. Several of the people whom I interviewed were concerned that the internet was transforming the game in negative ways. Points of criticism included the idea that people seem to take the game less seriously on the internet. These comments usually took the form of pointing out that games tend to be quicker when playing online. One person I interviewed also confessed that when he played on his lunch break he frequently resigned in the middle of a game simply because he had to go back to work. Others complained that in playing online one does not get the tactile experience of holding the Weiqi stones in one's hand, and that one misses the opportunity to develop strong friendships by having a live partner in the room. Yet if the internet does not have the same visceral feel as a live game, or the level of intimacy and friendship that face-to-face interaction might offer, it also has many benefits. Friendships develop on KGS that can arguably be seen as a community, albeit one that is largely made up of people who have never met face to face. Many people I interviewed in China voiced appreciation for the fact that the internet allowed them to play for free. They also lauded the idea that they could play at four in the morning if they chose to do so. Many advanced Weiqi players review their games from memory. For those of us without such remarkable skills, online servers allow us to review an accurate record of our games. It is also possible to try out alternative moves, and then find one's place at a different point in the game, without ever becoming confused at the order that was actually played. If someone has completed a particularly interesting match, or received especially good advice while reviewing it, he can save the game and its commentary on the server. He can also download it to his computer if he so chooses. More than half a billion people in China have access to the internet.11 Weiqi players belonging to the other half of China's population must seek other venues to play. One should remember, however, that for Weiqi players who do have online access, this is not an either/or choice. Many people who use internet servers also play their opponents in person. Someone might play an online Weiqi game with a stranger and then play the next game with his oldest friend. Beijing is a large and sprawling city with extreme weather and a dense population. Rather than taking an hour's ride on an uncomfortably hot and thickly packed subway to play Weiqi with a friend, one might arrange to meet on an online server. In China, where traveling abroad still represents a significant expense for even the middle class, the internet also offers Weiqi players the rare opportunity to play and chat with people from beyond their national borders. 5 to 7-duan amateur Near Professional Level. 8-duan amateur Near Professional Level. This rank is not given in China. It can only be achieved in international competitions. To gain an unofficial rank one simply needs to play. Internet servers will rank players compared to how they perform with other players at that site. In China, Weiqi schools for children also assign their own ranks based on competitions with their own students, or with students from other children's schools. These ranking systems are somewhat unreliable, however. Children's ranks are highly inflated. For those who gained ranks on the internet, one must identify which server one obtained one's rank on, as the levels vary there as well. For example, when asked my rank I would state that I was 2 or 3 ji on the KGS server. This rank would not be the same rank on the IGS server, and would be yet a different rank had I competed at the American Go Association. At the children's school I attended I was ranked as a 1 or 2 duan player. Many people I spoke with told me that it was quite normal for children's ranks to be inflated because most teachers at children's schools felt that rising in the ranks helped to encourage amateur students. From 2010 to 2011 I wavered on the edge between a 2 and a 3-ji rank on the internet Weiqi server KGS. This placed me in a strong intermediate status in the US, though in China the same rating merely signified a strong beginner. For those in China who took the game seriously, having a ji rank was a childhood memory. My level was approximately equal to a ten year old who had received formal training in the game. I was better than most adults in China who had not taken classes as children but far weaker than adults who took the game seriously. Although my rank was hardly something to boast about in China, it was good enough to favorably surprise most people I interacted with and marked me as an insider of sorts. I was the weakest player at the park but it was rare that I wouldn't win at least one game on the days that I played. Because I was so decidedly the underdog, and something of an anomaly, people tended to root for me and offer a bit of good-natured teasing to my opponents on the occasions when I won. I have often heard Western Weiqi players liken earning a duan rank to obtaining a black belt in martial arts. Indeed, there are similarities. Years ago, when I began taking Tae-kwon-do classes I had conceptualized black belts as being experts. In contrast, those who had earned black belts often emphasized that this represents a mastery of the basics so that they could then begin to hone their skills into an art. In the same fashion, most Weiqi players in America tend to speak of an amateur-duan rank as representing an expert level whereas people in China see it as an intermediate step in which they had developed a firm grasp of the basics. These fundamentals include memorizing set openings, "life and death" situations for particular groups, and set patterns (dingshi). Many people I interviewed told me that only after they achieved this could they then start to be creative with the overall flow of the game. Because professional players are much more of a real presence in China than in the West, amateur duan players in China are more acutely aware of the limitations of their playing strength. The dividing line between amateur and professional Weiqi players is at times fraught with contradictions. Some people who obtain a professional rank quit in favor of other pursuits, but they will continue to retain their professional ranks for the rest of their lives. There are also famous people with amateur ranks who spend their lives as career Weiqi players, living on prize money from competitions that are open to amateur players. Some career players who have amateur ranks clearly resent being locked out of the professional competitions because they were late bloomers at the game. Others who earn the right to become professional players by winning national or international tournaments opt to retain their amateur status with the rationale that it is better to win a smaller amount of prize money in an amateur competition than to lose at a professional competition. Because of the prize money offered at professional competitions, the very top players earn an impressive income. The most lucrative competitions include the Ing Cup (US$400,000), Toyota Denso Cup (US$260,000), LG Cup (US$210,000), Samsung Cup (US$170,000), Chu-Lan Cup (US$150,000), and the Fujitsu Cup (US$130,000).16 One must have a professional rank to enter any of these competitions. Quite often, however, the same dozen players win all of the largest prizes so that there is little prize money left over for anyone else. As a result, the vast majority of professional Weiqi players make their living by teaching lower ranking professionals or particularly talented high-ranking amateurs. At the ages of five through seven, boys only slightly outnumber girls in Weiqi classes. By the time they are nine or ten, this is an almost exclusively male domain, with approximately one female student in a class of fifteen or twenty students. The university club I attended generally had between one and three women out of ten to forty club members present at any meeting. In the park, where the regular players were primarily in their sixties and seventies, not once did I see a woman play a game or stop to watch for more than a minute or two. Of the 528 professionally ranked professional Weiqi players in China, 89 are women. Female professionally ranked players who are still participating in competitions number 42 out of 285. Of the 32 players that have earned the highest rank of 9-duan professional in China, only 2 are women.17 To its credit, China's government has tried to make a place for female players. When I was conducting my fieldwork, three of the twenty professional ranks that were awarded every year were reserved for women. The women played against each other because they could not win in the male competitions. The government has also given women a higher age limit to take the professional exams. Whereas male players must earn the professional duan rank before they turn seventeen, women can continue to compete in the professional-duan rank competitions until they turn twenty. While this has greatly improved women's chances to become professional Weiqi players, for many people I interviewed it also seemed to confirm the belief that men are just better at the game than women. Almost everyone I spoke with in China, including many women, stated that men are superior Weiqi players because they are by nature better than women at logic and spatial comprehension. People also told me that boys are naturally more aggressive-a trait that they felt could be harnessed to be competitive in Weiqi, and in society as a whole. Almost no one raised the issue of gender being shaped by parental or societal expectations. During the breaks at children's Weiqi schools, boys yell, run, and scream with reckless abandon. I never saw the female students participate in the frenetic activities around them. Instead, they tended to quietly talk with the teachers or look on while laughing or rolling their eyes at the boys' antics. At the Wenbo School summer program, my lone female classmate was a quiet but intense nine year old. Most of the students finished a game in approximately twenty or thirty minutes. In contrast, regardless of how much the teacher encouraged her to speed up, she made moves at her own extremely methodical pace, often taking over three hours a game. To some degree this seemed to be psychological warfare against her male classmates (including me) who would begin to daydream or fidget after a five minute pause without a move. Yet it was also because, unlike the rest of us who lacked the concentration to focus on any but the most pivotal moves of the game, she read out every single move. Over lunch, one of the teachers told me that my female classmate would never improve if she continued to play so slowly. Still, she defeated me, and many of her other male classmates through an unparalleled determination complimented with patience and remarkable insight, both on the board and in regards to her opponent's psychology. This combination had allowed her to persevere when her female classmates had dropped out of her classes. Maybe girls are not as good at logical thinking and they need more encouragement when teaching them. When I was teaching girls I couldn't find the answer. It is easier for them to become discouraged and they are more uncomfortable than boys with criticism. Maybe the critical teaching style is not the only way to do it. As with children's training in general, it is hard not to be struck by how openly people told me that girls are not as talented at the game. Many claimed that it was because girls just aren't very good at logic or spatial cognition. An equal number of people told me that girls aren't aggressive enough to do well at the game. Weiqi teachers frequently made these statements in front of female staff or students who seemed to take the comments in stride. Notably, almost all of the women I spoke with, including several who had become expert Weiqi players, also cited boys' natural aggression and superior ability at logic as the primary reasons that more boys played Weiqi than girls. Given the ratio of male players to female players, the dearth of female professional Weiqi players, and the fact that Weiqi teachers are daily confronted with female students who seem to progress more slowly than their male counterparts, it is hardly surprising that all of the Weiqi players I spoke with, including female players, agreed that girls just aren't as good at the game. Yet this also speaks to larger cultural understandings of gender that remain unquestioned in relation to motivation or larger social pressures on girls to find other pastimes. It may also be that, consciously or subconsciously, the classes were designed with male students in mind. The teachers' often-critical comments to their students seemed more in keeping with disciplinary techniques for boys, for example. The remarkable amount of leeway for the boys to run, scream, and roughhouse during the breaks also established the Weiqi classroom as a male-dominated domain. That Weiqi helps to discipline boys who are said to be naturally unruly was inevitably one of the first points people brought up in my interviews. Unlike conversations about girls, discussions about boys being aggressive are not framed as a negative trait. Nor is the goal to remove aggression. Instead, Weiqi is seen as a means to harness it for productive ends. Without exception, the adults I interviewed stated that girls are naturally quiet and fragile and that it would therefore be wrong to hit or scold girls because of their more sensitive temperaments. In contrast, boys were thought to be innately aggressive, rambunctious, and resilient. Most thought that this meant that scolding and spanking them was necessary, but that boys would not be emotionally troubled by these forms of punishment. Boys were also thought to be able to withstand harsher criticism. At the Weiqi schools, the startlingly frank assessment of the children's abilities, and the ways that teachers scolded children when they did not play well, also seemed more appropriate for the cultural context afforded to male interactions. In other words, their Weiqi training matched boys' experiences at their elementary schools and at home. In contrast, the girls may have felt out of place in this relatively hostile environment-increasingly so as the majority of their female classmates dropped out. Though mothers are no doubt a part of the decision-making process to send their children to Weiqi schools, tales of parental influence consistently referred to fathers' encouragement, and often insistence, that their children study the game. Sylvia, a 3-duan amateur and Peking University student who had trained to become a professional Weiqi player as a child, was one such case. Sylvia's father pushed her to train to be a professional Weiqi player in spite of the fact that, as a female, the odds were against her success. Although she did not become a professional Weiqi player, she did enter a traditionally male area of study (biology) at China's preeminent university. In many ways Chinese women's roles have become more traditional in the last two decades as China's population moves away from the gender erasure that took place in the early decades of the communist state. Yet cases such as this attest to a growing set of options for women, both in and out of the Weiqi sphere. Fang Weijing is a 2-duan professional and Peking University team member. She was also a member of China's national Weiqi team from 2000 until August of 2011, and one of four female players to be admitted to China's national team in the first year that women were allowed to join. With full knowledge that most parents would be ecstatic if their children were admitted to Peking University, she smiled when she told me of her parents' unusual preference for her Weiqi career. Fang's account depicts parents who are exceptional in encouraging her to enter such a male dominated sphere. Yet their support of her Weiqi career, as a woman in a very male oriented world, might also stem from traditionalist assumptions that she would eventually get married and that her husband would be the primary income earner. As a former member of China's national Weiqi team, Fang Weijing has made a name for herself in mixed doubles competitions. In Weiqi, pairing a man and a woman to take turns making moves is a highly specialized format that evolved out of competitions at formal sporting events. In these cases, because the male teammates are stronger players, and because they are not allowed to communicate with each other during a game, the female teammate's job is in part to follow her male counterpart's lead. She must see the long-term progression of his moves and support his strategy. This is not to downplay the women's achievements in this regard-they are members of the national team after all. Nonetheless, it does further highlight the fact that even as women have entered Weiqi's professional realm, men continue to dominate the game. As with the men's national team that was established two decades earlier, women's entrance into professional Weiqi was born of international competition. Fang Weijing emphasized that she was still ranked as an amateur player when she was admitted to the team in part to note the poor state of China's Weiqi only a decade earlier. Still, her statement also implicitly highlighted the progress that has been made because today there is a greater number professionally ranked female players. In contemporary China, women have more options in sports and a range of other careers. This is by no means an uncomplicated process, for globalization is ushering in an array of contradictory messages for both women and men. It has inspired women to enter the workforce and to become housewives, to rebel against patriarchal control and to embrace it. As with men, rather than providing one template for women to live by, globalization and modernization seem to have created a greater range of choices for women. Expressions of contemporary womanhood are drawn from a mix of iconic images from Imperial China, Republican China, the early communist era, and today's globalized mass media. This includes several models of womanhood ranging from the early communist era Iron Girls (who were famed for doing men's work such as coal mining), to housewives, to businesswomen. This is not to suggest that a woman is absolutely free to do as she chooses, for who is? In making these decisions she must rely on personal preferences but she does so in the context of social conditions. These include parental and peer pressure, different regional cultures (Beijing, Shanghai, or Hong Kong for example), and the economic and educational opportunities available to her. Regardless, if we consider China's population as a whole, there are more options for women than ever before in Chinese history. That women have gained entrance into the Weiqi sphere is no less than a miracle given the cultural biases against them. Yet it is a phenomenon that can also be seen in an array of other occupations and educational settings. Taiwan's Weiqi team is rife with cultural and political ambiguity, stemming from the disputed nature of Taiwan's status as a nation or a Chinese province. Most people in Taiwan continue to think of it as an autonomous nation. It has its own government, military, currency, and distinctive culture, though it has influenced the PRC so much with its popular culture that the cultural divide is less than it once was.33 In turn, the PRC points to the fact that Taiwan is overwhelmingly ethnically Chinese, and that it was part of China's territory before Japan took it as a colony in 1895. China reclaimed Taiwan after the Second World War under the Kuomintang government that fled the communist revolution in Mainland China soon after. The communist inspired PRC government continues to rule Mainland China today. Both Taiwan and the PRC continue to devote a tremendous amount of energy and finances in an attempt to control world opinion on this matter. An uneasy truce has settled in which Taiwan can, for the moment, retain its independence. Importantly, this is at the cost of asserting its nationhood outright-a proclamation for which the PRC has threatened immediate invasion. The differences in conceptualizing Taiwan are never more apparent than with sports teams. Taiwan, as a sovereign state, has its own teams in both the Asian Games and the Olympics. Yet to assuage the PRC government, the team cannot be called the "Taiwan team." Instead it must go by the moniker of the "Chinese Taipei" team. Taiwan, as well as the Olympics and Asian Games administrators, abide by the PRC mandate that Taiwan not proclaim its independence by using the country's name. Still, the very fact that Taiwan has its own team implicitly acknowledges that it is a political entity, for if it is not a separate nation how can China have two teams in the same competition? Taiwan's Weiqi team furthers this ambiguity because traditionally Taiwan's Weiqi players who wanted to compete professionally moved to Japan to train. In part this was because Taiwan was a colony of Japan from 1895 to 1945. The two cultures continue to share a great deal today. In part it also attests to Japan's continued centrality in the Weiqi sphere. In 2010, the Asian Games, the largest sporting event in East Asia aside from the Olympics, included Weiqi for the first time. South Korea dominated the Weiqi competitions, with three gold medals and one bronze. The PRC had three silver medals and Taiwan tied with Japan for third place with one bronze medal each. Taiwan's women's team earned its bronze medal. This team included Hsieh Yi-min and Joanne Missingham (Hei Jiajia), who are especially worthy of mention here. Hsieh Yi-min is a 6-duan professional from Taiwan who, in keeping with tradition, moved to Japan to train. Hsieh is notable less because she took this well travelled path than because of her unprecedented success as a female Weiqi player. She is often referred to as the best female player in Japan, where she has won every important women's division championships. She is also known for holding more simultaneous Weiqi titles than any other woman before her. Joanne Missingham is a 5-duan professional. Missingham was born in Australia to a Taiwanese mother and an Australian father. She moved to Taiwan with her family at the age of four and, unlike earlier generations of Weiqi players in Taiwan, she trained in Taiwan rather than moving to Japan. She was also the first Australian to earn a professional Weiqi rank. Joanne Missingham thereby highlights the Taiwan team's national ambiguity in unique ways. Missingham also holds a unique place in the public imagination because many people in Taiwan and the PRC find her to be physically attractive. Any cursory search on the web for her name will produce as many pages devoted to her appearance as to her considerable Weiqi achievements. Missingham has used her notoriety to make a call for equality in Weiqi competitions. When she played Weiqi at the 2011 Qiandeng Cup, for example, she learned that, in addition to the prize money, the competition would award US$286 for every game that a male competitor played, whereas the women's division players would be given nothing.34 In protest, she and the three other female players withdrew from the competition. A week later, while playing at another competition, Missingham held a fan inscribed with the Chinese characters "protest against gender discrimination (kangyi xingbie qishi)." This event gained far more press coverage than all but the most prestigious Weiqi competitions. Most of the people I spoke with simply shrugged and said something to the effect of "That's just the way it is" or "Men are better players so they should get more prize money." It seems very likely, then, that the publicity surrounding this event had more to do with a series of photos of the attractive Missingham than a general concern with the gender inequality at the competition. This also points to the ways that Missingham is using her special position in the Weiqi world to achieve greater ends. Missingham, both by virtue of her mixed race, her Australian nationality, and her physical appearance, is a conceptual anomaly for many. One should not forget, however, that as a Weiqi player Missingham is a force to be reckoned with. She was only sixteen years old when she competed in the 2010 Asian Games her star is still clearly rising. Over the years, Taiwan has also had some remarkably talented male Weiqi players. At the moment, however, both Hsieh and Missingham have become household names in China and Taiwan-even among people who have no interest in the game. In their own ways, both Weiqi players highlight the tensions that surround Taiwan's political status while also contesting gender biases. What does it mean to be a man? In any culture the answer to this question is fraught with an overwhelming range of often-contradictory possibilities. If one explores this issue in conjunction with the breathtaking cultural changes in China over the last few decades, the complexities of the issue grow exponentially. On the surface, the board game Weiqi might seem to have little to do with constructions of masculinity, since the overtly physical is often privileged in these paradigms. Yet Weiqi continues to be a decidedly male realm that incorporates historical images of the Confucian gentleman, martial strategists, innate genius, and an unforgiving work ethic. It serves as an emblem of intensely male-coded Chinese culture that is both localized and transnational in East Asia's political economy. The extreme male orientation of Weiqi clubs and schools offers a different construction of masculinity than most gender studies on China, which tend to define manhood in the context of sexual orientation, womanizing, or Chinese-style machismo.35 These are of course important areas of inquiry, but in examining the ways that men construct cultured personas through this game I hope to address a different set of issues than the current scholarship provides. Other ways to proclaim masculine identities include Confucian filial piety, devoted fatherhood, and being a good husband. They might also feature the embodiment of righteousness, benevolence, intellectual prowess, proper citizenship, and loyalty to one's friends and to the state. Weiqi is an unexamined sphere that incorporates many of these attributes in its imagery, thereby evincing an intricate web of cultural values. These virtues are drawn on to establish the ways that Chinese boys become men, and the manner in which men construct their new identities by incorporating ancient paradigms. There is surprisingly little scholarship on normative masculinity in China. To the degree that Chinese masculinity has been addressed, it has largely been in the fields of literature and film studies.36 Anthropological inquiry, and indeed the social sciences as a whole, has been curiously slow in rising to this challenge.37 As China reclaims its past by moving away from earlier communist ideals, modern constructions of gender are strikingly similar to those in days of old. This includes engaging in ritual (li) and the continuation of men's traditional use of women as currencies of exchange.38 It also features the reemergence of traditional dress, behavior, and vocabulary in an array of dining and drinking establishments.39 This reemergence of classical etiquette conspicuously manifests itself by appropriating traditionalist forms by self-consciously situating itself before PRC attempts to erase China's past. It is no coincidence that these constructions of masculine identity also hearken back to an era of unquestioned male supremacy at a time when China thought of itself as the undisputed dominant power in the world. Weiqi, as an extension of traditional gentlemanly behavior, is part of this process-a reinvention of tradition as a uniquely modern act. Because my three primary fieldwork sites included different age groups (children, university students, and retired senior citizens) I was witness to distinct stages in men's lives. Weiqi's imagery shifted in each setting. It was lauded as a disciplinary mechanism that taught logic and proper behavior to children. For university students its imagery was used to critique China's highly competitive political economy and to construct an idealized form of manhood that was based on images of cultured gentlemen from days of old. For the elderly it was an emblem of how much life in China had improved and for the pleasures of leisure in one's old age. Economic class was also a point of contrast. The children who could afford Weiqi instruction ranged from decidedly middle class to elite, as did the vast majority of Peking University students. In contrast, the parkgoers were working class and frequently evinced a more openly aggressive masculine ethos. This could be seen in their behavior and speech but also in their playing styles. Peking university students made moves relatively slowly and cautiously. If they spoke during a game it was in hushed tones. In contrast, working-class Weiqi players at parks played far more aggressively on the board as their friends loudly commented on their games. The differences in the cultural meanings of the game were in some ways less remarkable than the commonalities of the themes that these very disparate groups spoke of. People in all three of my primary research sites emphasized the importance of the Weiqi strategy of "seizing the initiative" (xianshou), for example. Seizing the initiative represents more than just a playing style. It is a statement of one's place in society, individual psychology, and performance of masculinity. It is an attempt to control a situation, to maximize profit, as well as to dominate, and avoid being dominated, by other men. Weiqi players frequently assert that in teaching this lesson the game builds character and trains one to be a better man. As my fieldwork in Beijing progressed, it did not take long before patterns emerged that linked individual masculinities with the perceived particularities of nation and race. Beijing residents uniformly spoke of people in Japan as being cautious and contemplative players, of Koreans as being impulsive, intuitive, and aggressive, and of the Chinese style of play as having found the proper balance between the two. These approximations of regionally bound playing styles draw on, and confirm, widespread social stereotypes in China about men in all three cultures that extend beyond the prevue of the game. As in other areas of the world, China's historical and literary accounts of warfare include tales of daring physical prowess. Yet Odysseus-like figures who win battles through cunning are remarkably prevalent in these accounts. Instead of being something to be ashamed of, intellect, combined with a healthy dose of craftiness, is usually framed as being heroic in these tales. This, in turn, shapes the ways that contemporary men in China think about Weiqi, war, politics, economics, and maneuvering in social hierarchies. Rather than being seen as separate spheres, they are frequently represented as being intricately interlaced and Weiqi is thought to train a man to maximize his advantage in any situation. Because of its ancient roots in elite Chinese society, Weiqi is a class marker in the present age and a reminder of China's historical greatness. Parents hope that their sons will profit from emulating historical figures who embodied elite gentlemanly behavior and subtle military strategies. This is as much a part of the rationale for teaching boys Weiqi as the more demonstrable benefits of math and economic strategy, for which the game is frequently lauded. In short, Weiqi provides a way of embracing the past to meet the future. It is a means to teach one's sons not only rational thought, but also the proper demeanor and mindset associated with cultured gentlemen in China's ancient history. In doing so they appropriate the past to help mediate the present moment. Weiqi is also an emblem of masculine behavior that is grounded in East Asian competition. There is a good deal of scholarship that have explored the ways that Chinese concerns with masculinity are in part a reaction to feeling emasculated by Western Orientalism in both the colonial period and today's global media.41 However, this is only one set of concerns that vies for attention with emotions arising out of the perceived humiliation of being dominated by Japan in the Pacific War, disempowered by the elite in Imperial China, or by the somewhat Orwellian early decades of the PRC government. Studies focusing on acts of resistance against the hegemonic West have arguably given it corporeal form. As issues of globalization and localization, Orientalism, and its corresponding forms of resistance have become more central to English-language China Studies, there is a danger of losing sight of the fact that there are concerns in China that do not directly relate to the West. It is true that most status symbols in China evoke Western imagery-suits, sports cars, and coffee shops, to name a few. Yet Weiqi is both high status and Chinese and thereby takes on great symbolic force for both the individual and the nation. In China there is very little separation between conceptions of individuals and society. Rather than extoling notions of Adam Smith's "invisible hand", in which self-interested individuals are thought to balance each other out for a harmonious, just, and profitable society, the Chinese socio-political model is based on Confucian conceptions of loyalty, benevolence, and obedience. By extension, the microcosm of a son's filial behavior is intricately linked with the macrocosm of loyalty to the state. In this worldview, a healthy and well-educated son will lead to a robust race and nation. This conceptual framework draws on Confucian theory and, more often than not, defaults to an iconic vision of a cultured gentleman who lives his life beyond reproach. The idealized male citizen who evokes this image continues to occupy a central part of the Chinese worldview today. Conceptions of masculinity are not only discussions of individual psychology and behavior, therefore, but also represent a masculinized nation-state that is based on a nostalgic recreation of the past to suit the modern age. This book is an effort to see a more personal side of Chinese life. This is not to say that China's political economy can be ignored. Nor is it to suggest that we should neglect Chinese nationalism. Yet for many, if not most people in China, nationalist sentiment is an afterthought. It is naturalized to the point that it goes unquestioned but it remains relatively peripheral to the way that people live their daily lives. Most people I spoke with were proud that China's economy had overtaken Japan's to become the second largest in the world, and they did not seem displeased to see that America had its own set of problems. Yet at the end of the day, like their American counterparts, they were far more focused on their careers and their family, their pastimes and their romantic relationships, than on anything beyond their nation's borders. When nationalist sentiments do arise in the Weiqi sphere it is usually in the form of pride in China's accomplishments. Though their East Asian neighbors are some of their main competitors in economics, politics, and Weiqi, discussions of Japan and Korea are for the most part broached with a remarkable amount of respect; even admiration. Weiqi is a shared culture, a mutual love, and a respected art that teaches a man to respect his rivals. In some ways this results in identifying with fellow Weiqi players more than with many of their countrymen. In the Weiqi sphere, the world is not only divided by nations, but also by those who do or do not play the game. 1 Ricci 1610:146. This quotation was taken from Paulo Zanon's translation (1996:70-71). 2 Taken from Pinckard 2001b: 20. 3 Hesse 1943:148. 4 Qi is also part of the Chinese name for Chinese chess (xiangqi) and Western/international chess (guoji xiangqi in the PRC, xiangqi in Taiwan,). 5 For more on Chinese middle-class aspirations in connection with the piano see Kraus 1989. 6 This is not to say that Weiqi is the only activity to do so. Calligraphy and mastering traditional Chinese instruments are but two other examples of this phenomenon. Yet, on the whole, Western symbology is far more salient in obtaining symbolic capital and class status in contemporary China. 7 Mahjong is also exceptionally popular. Yet, perhaps because it is a predominantly female pastime that often includes the illegal practice of gambling, one never sees it played outdoors. 8 See, for example, Aronofsky 1998; Gorris 2000; Edmonds and Eidinow 2004; Hallman 2003; Howard 2002; Waitzkin 1984; Weinreb 2007. 9 In 1992 Tim Casey released IGS, the first computer program to play Weiqi on the internet. In 1996, IGS was purchased by a Japanese communications company that moved its server to Tokyo. The IGS server can be found at: http://www.pandanet-igs.com/communities/pandanet. The Tom server can be found at Tom.sport: http://weiqi.sports.tom.com. 10 The KGS server can be found at: http://www.gokgs.com. 11 Foster 2012. 12 In Japan and Korea there is also an 8-duan amateur rank that some Chinese people have earned by winning international competitions. Internet servers often have an 8 and 9-duan amateur rank. 13 Historically, on very rare occasions 10-duan pro ranks were given in Japan as an honorary rank. This practice does not exist in China. 14 Wiki.goratings. n.d.; Singapore Weiqi Association. n.d. 15 For a list of players and their relative ranking in competitions see Post.weiqi.com 2012. 16 GoBase.org n.d. (http://gobase.org/games/nn/) 17 Post.weiqi.com 2012. 18 F. Liu 2006:491. 19 For more on these issues, see F. Liu 2006:498-499. 20 F. Liu 2006:496. 21 F. Liu 2006:496. 22 X. Wang et al. 2008. 23 X. Wang et al. 2008:57. 24 X. Wang et al. 2008:70. 25 X. Wang et al. 2008:61. 26 X. Wang et al. 2008:60-61. 27 X. Wang et al. 2008:60-61. 28 F. Liu 2006:497. 29 Jankowiak 2002:364; F. Liu 2006:500. This is arguably a modern continuation of trends that were established in the early years of the PRC. Honig and Hershatter have noted that Cultural Revolution images of the Iron Girls, in which women were expected to achieve parity with men in traditionally male occupations such as mining or machinery work, largely depended on women erasing their gender and acting more like men rather than including attempts to reform men (Honig and Hershatter 1988). Susan Brownell explored the mixed reactions in the 1980s when the women's volleyball team outperformed male teams in international competitions and the ways in which women's identities were defeminized in emphasizing their Chineseness over their gender (Brownell 1999). Similarly, Nancy Chen explores the manner in which the public face of Qigong defaults to a generic male (N. Chen 2002). 30 Because some might find their assertions about women's incapacity for logic to be offensive I have not included the identity of the two men who made these statements. 31 Interview. Fang Weijing. October 22, 2011. 32 Interview. Fang Weijing. October 22, 2011. 33 For more on this, see Moskowitz 2010, 2012. 34 2,000 RMB. 35 For more on constructions of masculinity through sexual orientation see W. Chou 2000; Simon 2004. For more on womanizing see Boretz 2004; Festa 2004; T. Zheng 2007; T. Zheng 2009. For Chinese-style machismo, see Boretz 2004; Boretz 2010; Festa 2004; S. Liu 2011. Ownby 2004. 36 See M. Huang 2006; K. Louie 2002; X. Zhong 2000. 37 Margery Wolf is one of the rare and early exceptions in that she focuses on both masculinity and femininity in her book The House of Lim (1968). Susan Brownell and Jeffrey Wasserstrom's edited volume Chinese Femininities Chinese Masculinities (Brownell and Wasserstrom 2002b) is also notable for giving equal attention to men in a series of studies on gender issues in China. In framing the title as plural masculinities, they also subvert tropes of a unified patriarchal system and choose instead to explore a range of ways that establish male/female relations and power hierarchies. 38 For ritual see Kipnis 1994. For the use of women as currencies of exchange, see Boretz 2004; Festa 2004, T. Zheng 2007. 39 Boretz 2004:183. 40 Interview. Guan Yang. July 16, 2010. 41 See K. Cheung 2002; Fitzgerald 1996; Harrist 2005; Z. Shen 2001; Tasker 1997; S. Zhao 2004. Go (Weiqi in Chinese) is one of the most popular games in East Asia, with a steadily increasing fan base around the world. Like chess, Go is a logic game but it is much older, with written records mentioning the game that date back to the 4th century BC. As Chinese politics have changed over the last two millennia, so too has the imagery of the game. In Imperial times it was seen as a tool to seek religious enlightenment and was one of the four noble arts that were a requisite to becoming a cultured gentleman. During the Cultural Revolution it was a stigmatized emblem of the lasting effects of feudalism. Today, it marks the reemergence of cultured gentlemen as an idealized model of manhood. Marc L. Moskowitz explores the fascinating history of the game, as well as providing a vivid snapshot of Chinese Go players today. 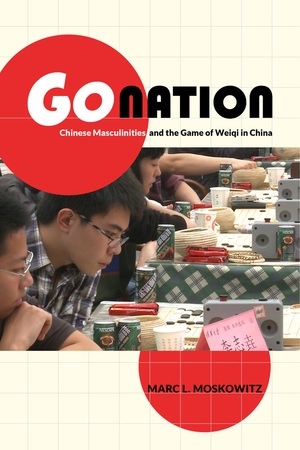 Go Nation uses this game to come to a better understanding of Chinese masculinity, nationalism, and class, as the PRC reconfigures its history and traditions to meet the future. Marc L. Moskowitz is Associate Professor of Anthropology at the University of South Carolina. He is the author of several books, including Cries of Joys, Songs of Sorrow: Chinese Pop Music and Its Cultural Connotations.